Due to popular demand, I am going to rewrite my blog post about my Inca Trail adventure. Be prepared, it`s kind of long. 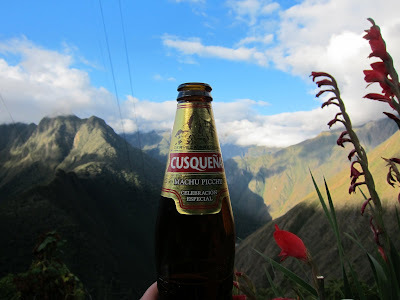 DAY 1 - I was picked up early in the morning (5am) and loaded onto a bus with my fellow hikers to embark on a 4 day backpacking trip along the Inca Trail. 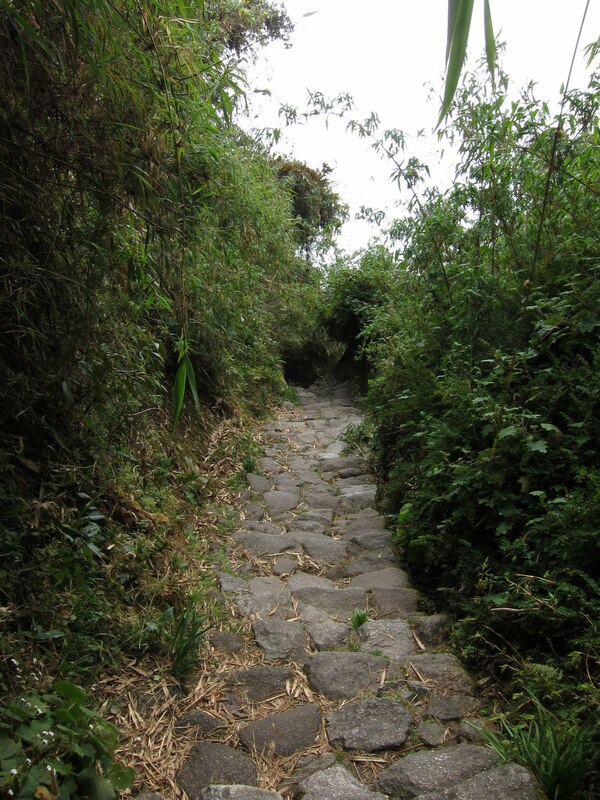 They call it the Inca Trail, but it is only one of several trails that the Incans paved with stone to travel from Cusco to Machu Picchu. It appears that the tourist-marked Inca Trail follows the path that Hiram Bingham took when he discovered Machu Picchu 100 years ago. Anyway, there were 13 people in my group and coincidentally 11 of us were Americans. The other two were a couple from Ireland. 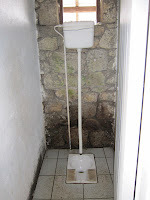 I was the only one in the group traveling by herself, which hasn`t been an infrequent situation for me. I rarely meet other girls traveling by themselves. I often get asked if I get scared traveling along and am lectured how dangerous it is for me. But the thing is, I never feel scared. Maybe I am too trusting, but it seems that most people are genuinely kind and helpful. I`ve definitely felt way more afraid walking home alone on West 9th Street back at home than I`ve ever felt in Peru. However, I digress. 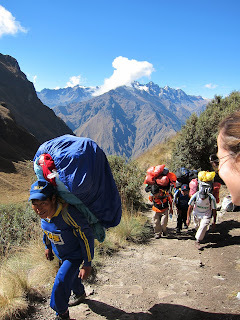 The bus dropped us off at a place they call ´kilometer 82` where we met the porters to begin our hiking journey. We had two guides: the flamboyant Fredy who was the tallest Peruvian ever, and Cesar, a wry yet flirty twenty-something. For 13 hikers we had 18 porters! Each porter carried a ridiculously heavy pack of 25 kilos. We, the hikers, barely carried anything aside from water and layers. It`s kind of hard to call it backpacking when you`re not carrying your own pack. Apparently, only about 6 years ago a law was passed which limited the amount of weight porters could carry. Up until then, some companies would weight each porter down with packs weighing upwards of 40 kilos! The first day hiking was pretty mellow but long and we arrived at camp around 4:30pm. We felt lucky that our group aged from 19-34 and were all quite fit because along the trail we passed many elderly folks struggling to make it up the hills. When we arrived at camp we realized why there were 18 porters needs for 15 people. The porters set up all the tents, including canopies for eating with tables, chairs, and silver cutlery! They brought us warm water in buckets with towels to our tents to wash our faces and brought hot cocoa and popcorn to our tents so we could relax while they cooked for us! Talk about luxury. I`ve always wanted to be treated like a princess, but in reality having "servants" is really awkward and classist. 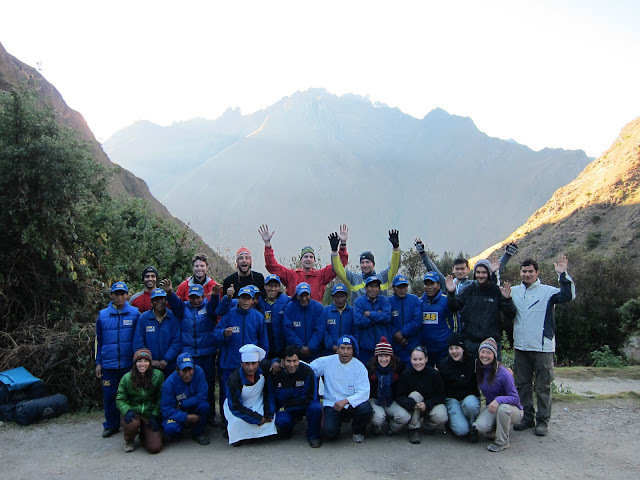 Our group felt guilty most of the time when it came to the porters waiting on us. I became good friends with the coordinator of the porters, Ricardo. I think he liked me because I would speak Spanish with him. 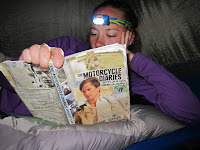 I shared a tent with Jessica, the token single girl in her group of friends and we had a great repoir. The porters cooked us a delicious 3-course feast and we ate like kings, and then went to bed. 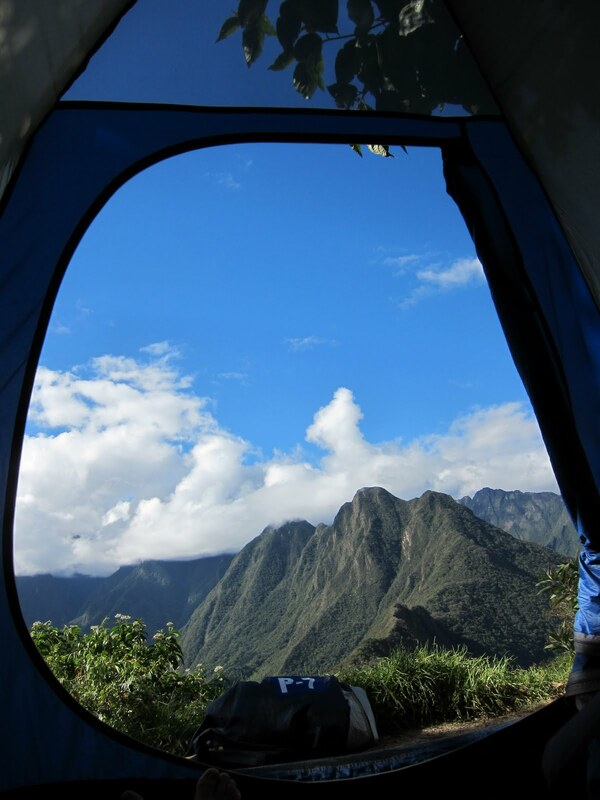 DAY 2 - We awoke that morning to a beautiful mountain view from our tents. My new friends from the midwest (namely Kansas) exclaimed that there was nothing this beautiful in Kansas. "Come to California!" I said, shocked because I`ve woken to picturesque mountain views countless times in California. I`ve traveled all over the world but I still think that California is the greatest place on earth. Anyway, after breakfast we started trekking uphill past gorgeous creeks and through riparian zones, increasing in altitude until we passed tree-line and summitted the first mountain. 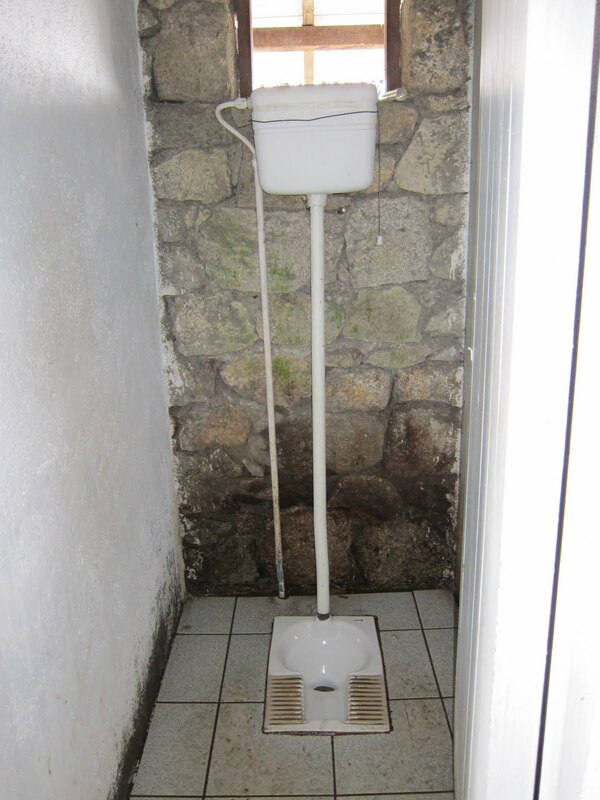 It was a tough climb, but after hiking the Misti Volcano it seemed like a breeze! The terrain on the first mountain was dry and covered with chaparral and cactus. We observed llama, white-tailed deer, and vicuñas grazing. By the way, vicuñas are my new favorite mammal - they`re like weird Andean deer with super long necks. As we summited the second mountain, the terrain changed to grassland. Perennial bunch grasses carpeted the hillsides and I imagined that this is what the Bay Area looked like before invasive annual grasses out-competed the native fescue. As we hiked, Cesar would challenge me by asking the scientific names of plants that I`d never seen before in my life! He`d say, "I`m not even an ecologist and I KNOW the name of this plant". I told him to come to California and I`d tell him the scientific name of every oak tree. As we descended the second mountain in the late afternoon, the vegetation changed once again to cloud forest. We explored various Incan ruins along the way to our second campsite which was more cloudy, chilly, and rainy. After another delicious meal, we were surprised with... hot toddies! Yes, I felt guilty that the porters had to carry in two bottles of run for us, but I must admit, it was pretty awesome. 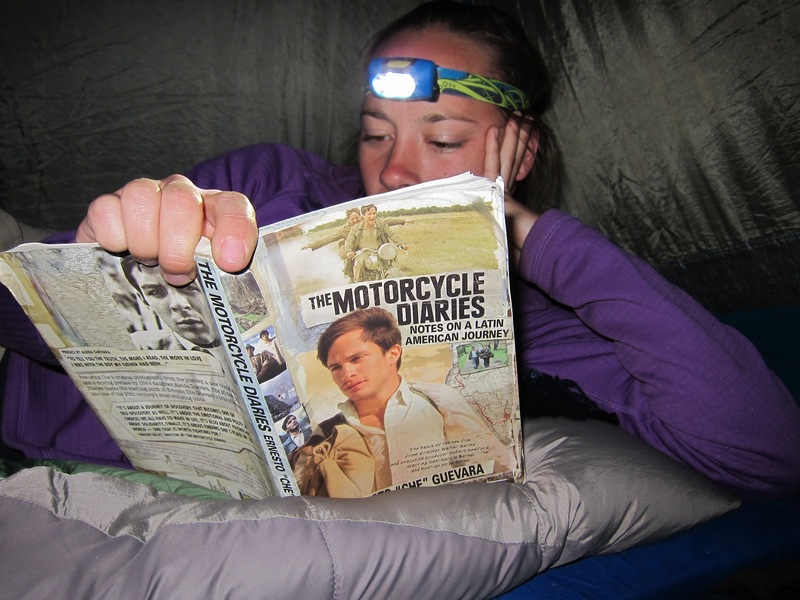 That night as we snuggled into bed, Jessica read aloud the Incan excerpts from "The Motorcycle Diaries" and we patted ourselves on the back for being such good little tourists. DAY 3 - This was the most beautiful hike I`ve ever been on! 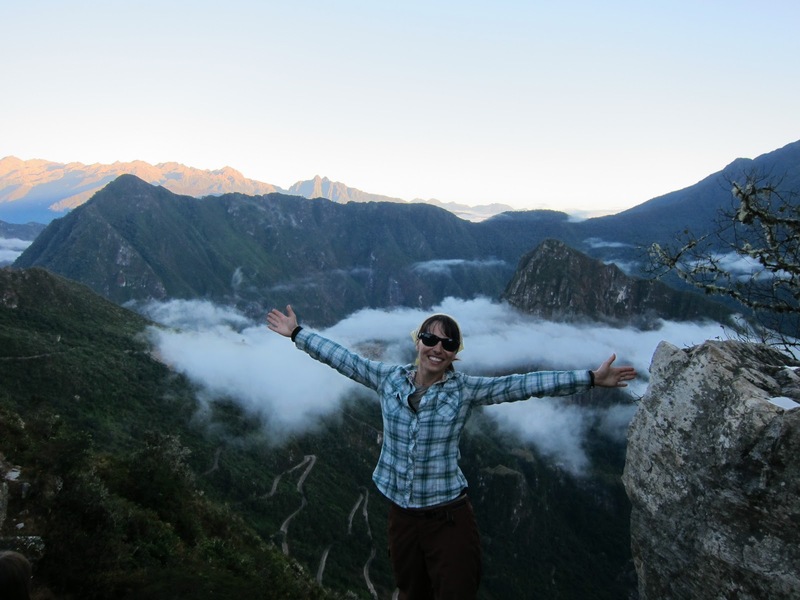 We began walking on the actual stone-paved Inca Trail which took us on a leisurely stroll through the cloud forest into the high jungle above the Amazon basin. The walls were covered with a dense moss that you stick half your arm in before it reached rock, orchids everywhere, and ancient ferns. 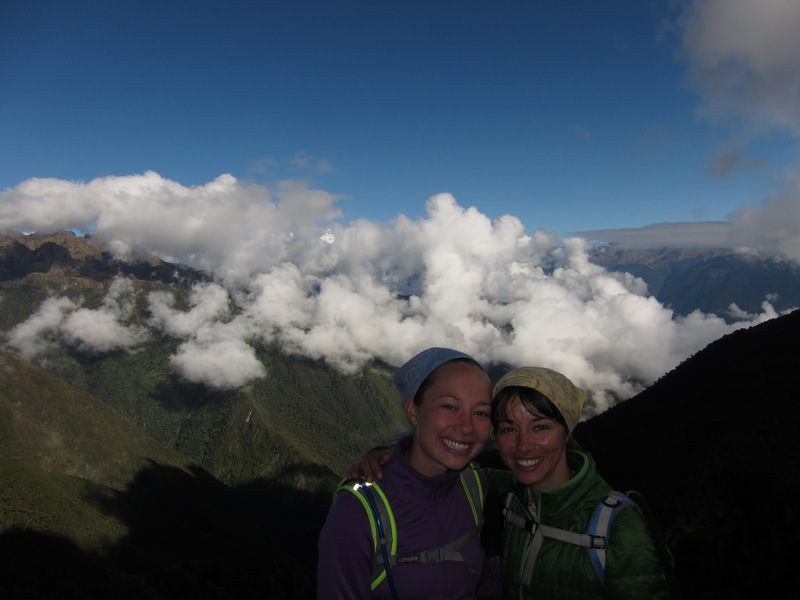 The trail was lush, green, and moist and took us past sweeping vistas of snow-covered mountains and riverine valleys. Fredy pointed out the mountain where "Touching the Void", a climbing documentary, took place. We arrived at camp midday and from our tents we could see the backside of Machu Picchu - so close! We shared some beers outside a lodge we were camped near and at dusk went to explore some more Incan ruins. I was down in the Incan runs with only my headlamp when it became completely dark. The ruins are like labyrinths and very easy to get lost in. Not to mention, the huge stone walls are very forboding in the dark. I kept seeing flickers of light and assumed they were the flashlights of my friends. The lights came closer and I called out to my friends. No response. I called out again, a little more panicky this time, and again, no response. Convinced that these were the ghosts of Incans murdered by Spaniards intenton taking revenge on those of European descent, I raced through the labyrinth, found my way to the path, and ran up 100+ stairs to the top of the hill. Heart racing and completely out of breath, I found my friends who immediately exclaimed, "Hey Melanie, did you see the fireflys?!" DAY 4 - We were woken around 3am to pack our bags, eat breakfast, and hit the trail. Of course, we hiked about 5 minutes before hitting the checkpoint where we had to wait until Machu Picchu opened at 5am. And then we hit the trail again, walking through the dark jungle toward one of the wonders of the world. It was light when we reached the sun gate, but the sun had not yet drifted over the mountain. At first, Machu Picchu was covered in clouds, but as the sun began to shine on the ancient city, the clouds passed and we were awarded with breathtaking views. 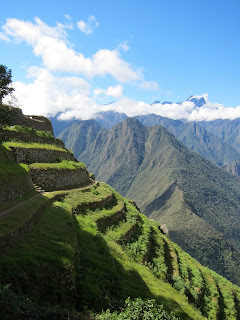 I`ve wanted to see Machu Picchu since the 5th grade when I learned about its agricultural terraces and irrigation channels, and it did not disappoint. The place is magical. We took our time walking down from the sun gate toward the ruins admiring it from every angle. The cool thing about Machu Picchu is that it is the only Incan city (found so far) that was not destroyed by the Spanish when they arrived around 500 years ago. Therefore, the only damage to the city is from fault activity, jungle taking over, and looters. So basically, it`s in pretty good shape. Also, "Machu Picchu" isn`t its true name. Hiram Bingham, the archeologist, got confused when he asked the local Quechua people if there were any Incan ruins nearby. The Quechua people pointed and said there where ruins on the big mountain. 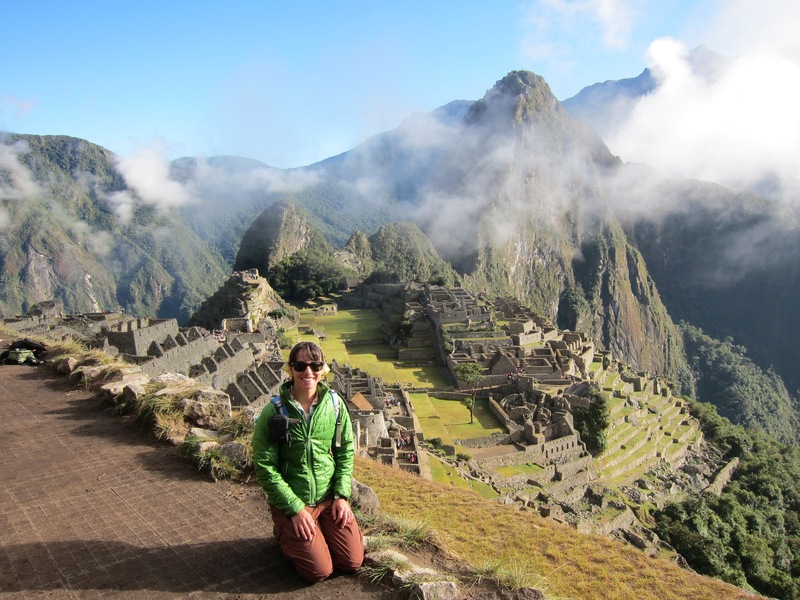 "Machu Picchu" means "big mountain" in Quechua. Anyway, Fredy took us on an informative guided tour of the ruins and then we waited in line for tickts to hike Wiñay Picchu, the famous pointy mountain behind Machu Picchu. While in line I hear, "Melanie? Is that you?!" The world starts to feel really small when you run into friends in the middle of nowhere in South America. 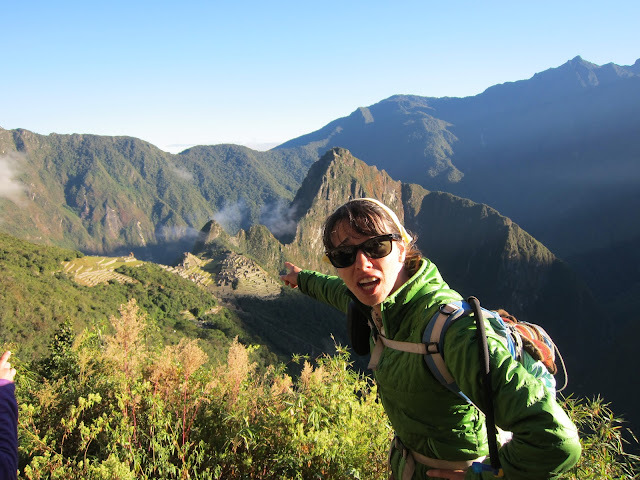 I chatted with Andy and Rose for awhile until I found out that my group arrived too late and wouldn`t be able to climb Wiñay Picchu after all. The rest of my group was burnt out and headed back down towards the town of Aguas Calientes, but I stayed to explore Machu Picchu for the the last couple hours that I could. I ran into British Joel, a gap-year kid we`d befriended on the Inca Trail and who preferred our group to his. Together we explored the fallen city, getting lost in the ruins. I told him about the movie "Labyrinth" (which he`d never heard of!) and how I half expected to turn the corner and see David Bowie, the goblin king. 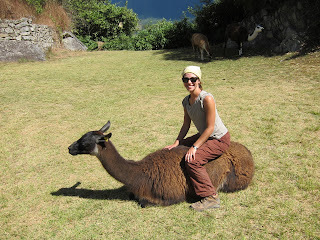 It ended up being okay that we missed Wiñay Picchu because we discovered a meadow being grazed by llamas! So of course, Joel and I took the rest of the time taking photos of each other posing ridiculously with llamas while continuously chanting, "What time is it? It`s llama-time!". 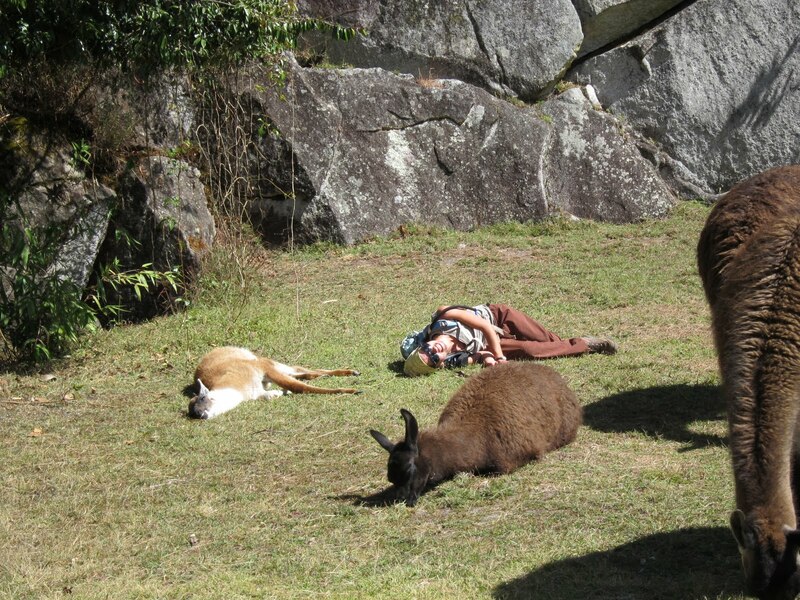 Don't you have a picture of you in Australia, lying down next to some wallabies? This is an odd and awesome traveling trope, you napping with native animals.